Gutters are designed to whisk water away from your home. If they are clogged with debris, it won't be possible for them to do this. 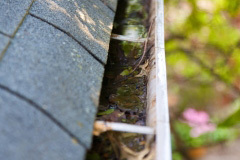 Removing this debris can be a time-consuming chore, which is why you may want to consider the services of a professional gutter cleaning Alabama specialist. Companies that do Alabama gutter cleaning might also install screens over the top of them. This helps prevent leaves from getting into your gutters in the first place, thereby reducing the number of cleanings that are needed. It only takes a few minutes to install these screens, but the time will be well invested over the long haul. Many people wonder how often they should perform gutter cleaning. Homeowners generally elect to have this task performed twice a year - once in the spring and again in the fall. The number of trees on your property will largely determine how often you need to have gutter cleaning done, as more trees means more leaves that could potentially get into your gutters and clog them. Safety Concerns: Gutter cleaning is performed by using a ladder to get to them. This poses a hazard of falling, particularly if the equipment is in poor condition or an individual does not know how to use a ladder safely. By hiring a professional contractor to perform gutter cleaning, Alabama residents like yourself can eliminate this worry while still having clean gutters that operate as they should. Perhaps you have thought about having a professional contractor clean your gutters, but felt it would be too expensive to get the work hired out. That's not necessarily the case, as there are a number of factors that play a part in an estimate for this job. How Much Does Alabama Gutter Cleaning Cost? Several things play a part in the cost of Alabama gutter cleaning, including what part of the state you live in. Below is a graph that shows the average range based upon previous quotes we've given. The amount of guttering on a roof is what affects gutter cleaning prices the most. That's because the biggest factor in determining cost is time. The more guttering you have, the longer a cleaning project will take. If you have an extremely steep roof that is difficult to access, it could take longer to clean out your gutters, thereby driving the price up as well. 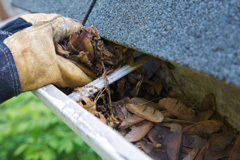 Extremely clogged gutters could cost more to clean out than those that only have a little bit of debris. You could also pay more if minor repairs need to be made to your gutters. Some contractors will repair small tears in the seam for a nominal charge. Repairing or replacing the downspouts could also result in additional charges. If you elect to have screens placed over the top of your gutters, this could add to the overall bottom line as well. In order to save money on Alabama gutter cleaning, check with your neighbors to see if any of them also need to have this work done. If a cleaning service can schedule several houses in your neighborhood for the same day, you could possibly receive a discount since the contractor would not have to travel as far to get to your residence. If you're interested in finding out how much gutter cleaning services will cost, you're in luck because we can help you obtain free quotes. Simply fill out the form you see below in order to get started. When you do, we'll match you with reliable contractors in your area who are pre-screened, thereby saving you time and money. It only takes a few minutes to fill out our form, so why not get started today? If you're looking for a no-pressure roofing quote service then we can help. Our specialist network provides free no-obligation quotes daily to people just like you for all roofing work. It's the easy way to save money, and it only takes a simple online form.